We are closely monitoring the changing forecasts and preparing for the worst of the predictions. Mutual assistance crews from Alabama and Georgia have begun to arrive. We have requested over 300 mutual assistance crews for the storm restoration effort. We have more than 450 overhead line contractors already working on the system and available, along with over 300 tree contractor crews actively performing reliability enhancement tree trimming work, in addition to preparing for restoration work. The National Weather Service has issued a Winter Storm Watch for the Washington Metropolitan Area from Tuesday evening to Wednesday evening. Weather forecasts are still changing, but some predict snow accumulations of about a foot through the Pepco region with wind gusts of up to 35 mph. A Winter Storm Watch means there is also a potential for significant sleet and/or ice. Heavy, wet snow, ice, and high winds can bring tree limbs into contact with power lines to cause power outages. Heavy rain and oversaturated soil can cause trees already weakened by previous storms to fall onto power lines and equipment to cause power outages. 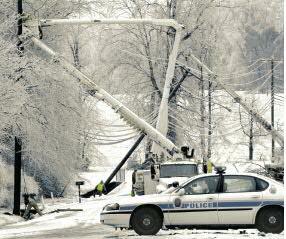 Outages can also occur due to drivers skidding into utility poles along wet roads. Customers are asked to please report any outages and stay away from any down wires. To report outages and/or downed wires, please call 1-877-737-2662, follow the prompts, and please ask for a call back to confirm that power has been restored. Call Centers are staffed and operational 24 hours a day through this event. Outages also may be reported through our website or through our mobile app. For more information and updates, follow us on Facebook and Twitter and download our mobile app. Winter storms can bring high winds, snow, sleet, ice and even a combination of precipitation. Heavy snow and ice can cause outages by bringing trees and branches down on power lines, while ice and sleet create slick road conditions that can cause vehicle accidents that damage poles and other electrical equipment. We closely monitor the weather and mobilize work crews before a storm hits to ensure that we respond as quickly and safely as possible should storm damage occur. Safety is our top priority, and we encourage you to review these tips and precautions to prepare for the worst of winter weather. Develop and practice an emergency plan with everyone in your household. Assemble an emergency storm kit containing bottled water, non-perishable foods, blankets, flashlights and fresh batteries, first-aid kit and prescription medications, special medical or infant supplies, tools and other essential items. Purchase a battery-powered carbon monoxide detector for your home if you plan to use an alternative source of heat. Fill your bathtub with water if your water supply depends on electricity. Make sure cell phones are charged. Protect and unplug electronic equipment. Ensure your contact information is up to date with Pepco (have your account number available, call 202-835-1007 and say “update phone number”). Download the Pepco Self-Service app on your mobile device so you can access outage maps, get restoration estimates, report outages and call us through a direct dial link should the power go out. If possible, gather in a central room that has an alternative source of heat such as a fireplace or wood stove. Keep freezer and refrigerator doors shut. Open window shades to let the sun warm rooms during the day; close the shades at night to keep warmth in. Dress in loose layers for warmth and flexibility. If the indoor temperature drops to 55 degrees Fahrenheit or below, open your faucets slightly so they constantly drip to prevent pipes from freezing. When conditions are safe, check on elderly or home-bound neighbors. If using a portable generator during a power outage, always operate it outside, away from doors and windows to prevent deadly carbon monoxide fumes from entering the home. Don’t use a gas range for heating a room or use charcoal to heat or cook indoors. Keep children and pets away from any open flames. Use a carbon monoxide detector to keep you and your family safe. Carbon monoxide is colorless and odorless. When snow piles up, it’s important to keep areas outside your home clear. Clear snow from access areas to your home and make sure to clear snow accumulation from appliance vents and heat pumps outside your home to ensure they can operate safely. Remember to take breaks while clearing snow and avoid over exerting yourself. Please remember to report outages and downed wires by calling 1-877-737-2662, using the mobile app or by visiting Pepco.com. You can also follow us on Twitter and Facebook to get tips on preparing for emergencies and updates on our restoration efforts.